My friend Liz suggested that I hit up Cafe Puerto Rico for some delicious mofongo. She had been there previously and said it was the best place to try some. Frederick and I rushed to get to the restaurant after the Bacardi Rum tour as they closed at 3:30pm. Arriving just in the nick of time, the waiter reluctantly accommodated us on the patio. I decided on the yucca mofongo with chicken. 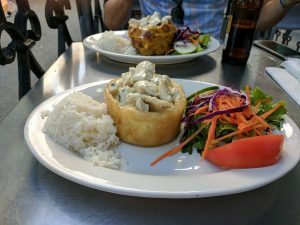 It was served with rice and a side salad. The closest thing I can compare it to is a pot pie, without the top crust. The yucca was flaky and dry, which complimented the chicken gravy perfectly. If you’re even in Old San Juan, I highly suggest you hit this place up for lunch or dinner. After freshening up at the Hostel, the gang headed out to La Placita. It’s essentially a large square surrounded by bars and clubs. You grab a drink (served in plastic cups, of course) and walk around socializing. There are people showing off their cars, motorcycles, and generally just strutting their stuff. 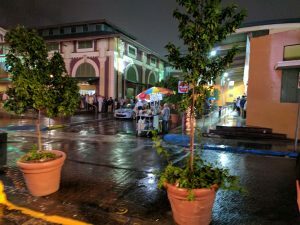 La Placita during a rain storm. Right after we get our drinks in hand: BOOM! It starts raining and everyone leaves the plaza like rats from a sinking ship. This was a blessing in disguise as it forced us to head inside to dance the night away. When the rain stopped, everyone poured out into the square again. A local told me that this was the first night since school was out for the Christmas holidays. This was the main reason why the place was so packed tonight, everyone was out celebrating. This was my last night in Puerto Rico so I wanted to go out with a bang and La Placita did not disappoint. My next stop would take me to a place most of you have probably never heard of before. A tiny little island in the Caribbean.